Inside: You don’t have to be a Romanov to have fun with Easter à la imperial style. 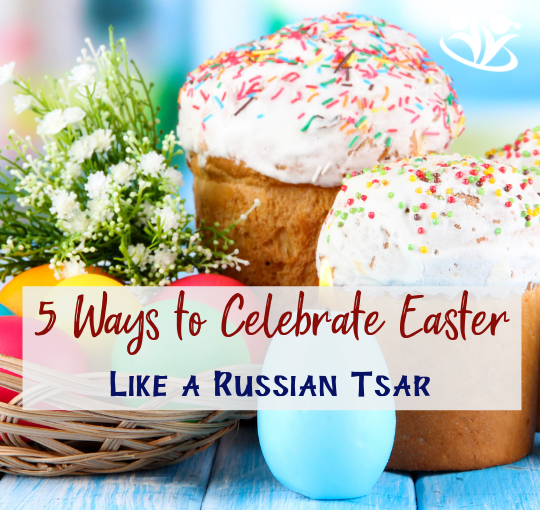 Here are five fun ways to celebrate Easter like a Russian Tsar. One of the incidents that I always think of first when I recall Easter celebrations in my childhood is what happened when our 150 pound Caucasian Shepherd broke free at night and ate all the Easter cakes. The kulich cakes—and there were a great many of them baked for Easter dinner with relatives—were tucked in straw baskets, covered with pretty towels and placed in a nice arrangement in the middle of the dining room table. The dog ate the cakes, licked up every crumb, and dragged the baskets behind the couch to chew on in spare time. In the morning, while running past the empty table, my mom asked, “Wherever did you put all the cakes?” without waiting for an answer. “I didn’t move them,” I said. “Can I eat one?” But I didn’t get a reply because she was already gone doing whatever it is moms do in preparation for relatives’ invasion. When the truth was discovered I made a heroic decision to replace the eaten cakes. It was my greatest accomplishment that year. I made kulich cakes on my own following instructions in my grandmother’s cookbook. Before you elevate me to sainthood, let me clarify why I did it. I didn’t want my parents to get rid of my dog on account of the cakes. My cakes didn’t rise well, were top heavy, and had a wicked tendency to tip over and land frosted top first on the carpeted floor. It was just as well because a bag of sugar in my mom’s cupboard looked exactly like a bag of salt, which we didn’t discover until my uncle bit into one of the cakes and froze with an intriguing expression on his face. Always taste the cakes before the guests, don’t trust the training of a 150-pound dog to a twelve-year-old, and never forget to spit. The lesson I learned the year of my salty Easter cakes: spit and let go. Or don’t sweat the small stuff. The tradition of celebrating Easter, or the resurrection of Christ, came to Russia at the end of the 10th century from the Byzantium Empire. At the time, Russian people already had a big celebration during spring equinox to honor the time of new beginnings and the resurrection of life after a long winter freeze. They were not interested in a new religion pushed upon them by the authority, and it was very much despised. Their pagan celebration of spring included many aspects that we now associate with Easter—eggs (an ancient symbol of new life), special buns/bread (to celebrate the earth’s fertility), and games and bonfires (to honor the gods). Vladimir the Great, who decided to make Russia Christian and took his advice from Byzantium clergy, pronounced these pagan traditions a sin and forbade them. However, he soon realized that if he kept pushing too aggressively, he was going to end up with an uprising on his hands. Russian people took their celebration very seriously. They believed that if they didn’t do it the way they always had, the Gods would punish them by destroying their lands’ fertility of and their stock’s health. If they had no crops and no stock, their children would starve and die. Their bloodline would end, and that was much worse than prosecution by the authority. The fight against pagan rituals lasted a few centuries without much success until the church came up with the bright idea to replace force with subterfuge. Instead of forbidding the celebrations, it decided to incorporate them into the Christian religion. And it worked. By the reign of Peter the Great, colored eggs, Easter bread, and festivities were openly encouraged. It was generally assumed that the merrier the Easter, the happier life in general. And by the time of the Romanov dynasty, the Easter celebration became the most important day of the year, even more important than Christmas. You don’t have to be a Romanov to have fun with Easter. Many aspects of their celebration are easy to replicate today. Disclaimer: this post contains Amazon affiliate links. If you make a purchase through Kid Minds links, we will get a small commission. Bread in Russia has always had significance beyond its nutritional content and monetary value. For ancient Slavic tribes, bread had a sacred meaning, and it was worshipped like the sun. Virtually all Slavic tribes held sharing bread as a gesture of goodwill and friendship. If someone refused your bread, they had bad intentions. Sharing bread was symbolically meant to represent an agreement to be friends. It was wicked to accept bread and then act against the giver. A great many varieties of bread are popular in Russia. Some bread is so special that you only bake it for specific celebrations. Kulich bread is only baked once a year on Easter. It features a distinctive cylinder shape with an onion-dome on top, just like a church building. The top is iced with sugar to represent snow and decorated richly with nuts, flowers, sprinkles, lemon peels, or dried berries for luck. Each piece is believed to contain a promise of happiness for the year to come. Kulich is easy to make in a metal tin without special equipment. The desire to paint eggs has existed since the Stone age. 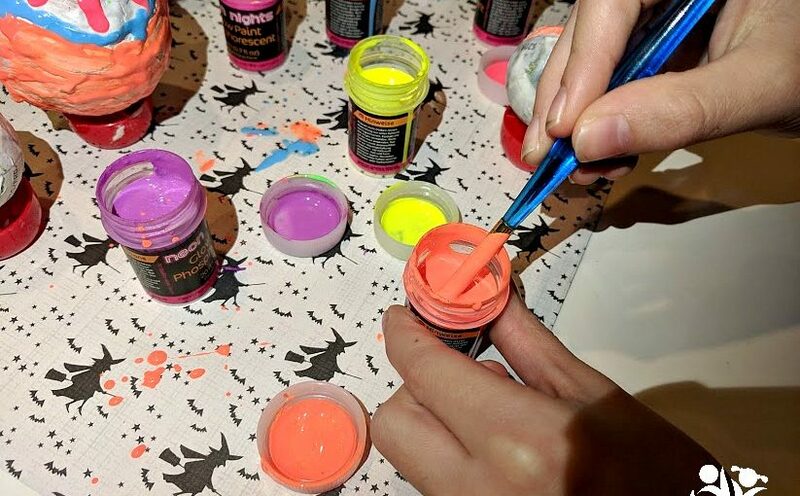 Scientists “found a cache of decorated ostrich eggs in layers in South Africa dating from 65,000 to 55,000 years before the present.” There are quite a few theories of why we dye eggs on Easter, but I think it goes back to the simple reason that it is fun. Goose, duck, and chicken eggs were all fair game for Slavic cultures, and the people developed a wide variety of decorating techniques. In my family, we are always trying different ways to decorate eggs. Our favorite ways to date are red cabbage and beets colored eggs and our own version of classical pisanki. Getting your house thoroughly cleaned before Easter is a long-standing Russian tradition. “Thoroughly cleaned” means not a speck of dust is allowed to stay behind. It involves moving furniture, getting rid of things that haven’t been used since last Easter, lifting carpets, scrubbing walls, and taking the curtains down to wash them. The cleaning is supposed to take place in one day, the Thursday before Easter, which is called Clean Thursday. In my house of six people and two furry pets, I have to start spring cleaning in December to get it done by Easter, and some years even that doesn’t give me enough time. Either my four kids are super proficient mess makers and clutter accumulators, or I’m just not doing it right. I’m pretty sure it’s the former. The symbolism of Easter cleaning is to cleanse your soul and your home for the happiness ahead. It also means removing the discord between who you are and who you want to be. The assumption is that you want to be the kind of person who is not afraid to open your soul and home to other people. It sure helped the Romanovs that they had a palace full of servants to do the cleaning for them. But do not despair. There is a way for all of us to get it done. Isn’t it ironic that a spur of the moment gift to take the Tsarina’s mind off assassination attempts in the spring of 1885 became such an enduring cultural phenomenon and a symbol of tsarism? Long after the Romanov dynasty disappeared, Faberge eggs are still admired and sold for millions of dollars. The first Faberge Egg was commissioned to cheer up the Tsarina amidst the terrorist attacks on the Royal family. It was made completely of gold and had a surprise inside. Tsarina Maria Fedorova was so pleased with the egg that Tsar Alexander III decided to turn it into an Easter tradition. He ordered a new Faberge egg for every consecutive Easter until the day he died. And this tradition was carried on by his son who ordered TWO Faberge eggs each Easter: one for his own wife and one for his mother. You can make your own Faberge eggs. They won’t fetch millions on the free market, but you will have the joy of looking at them for years to come. If the idea of Faberge eggs doesn’t excite you, how about an Easter tradition of an egg hunt? My kids are absolutely wild about egg hunts. We don’t do sweets on Easter in my family. So I usually have filled the eggs with stickers, LEGO pieces, small toys, dollar bills, coins, and dried cranberries. This year I discovered pre-filled eggs on Amazon. It definitely has saved me quite a few hours of hunting for items to fill the eggs. This is my favorite egg game, and some sources tell us that it’s been popular in Europe at least since medieval times. Each person chooses an egg (hard boiled nowadays, but originally the eggs were raw) and holds it with the thinner tip facing the opponent. Then they hit the tips of the eggs together. The person whose egg survives the impact moves on to the next person. The winner is the one whose egg stays uncracked by the end of the day. The game is not limited to members of your own family. Grab your strongest egg (and perhaps a few extra eggs) and run to your neighbors. The loser has to eat all the cracked eggs. Just kidding. Use them to make an egg salad. Our favorite is a mix of tuna, boiled rice, Mayo, and lots of eggs. And this is how you can celebrate Easter like a Russian Tsar! Are you looking for more Easter ideas? This post is part of Easter Around the World series! Click on the image below to explore more global Easter traditions.